"It's this place, so beautiful and full of promise. Rwanda, the people and the land, draw you in, take everything you have and make you dig deep within your soul, willingly, to keep searching for more." Sometimes an author's love for her subject is so strong it is palpable, flowing through every word, every character, every description of a place that is deeply etched in her heart. 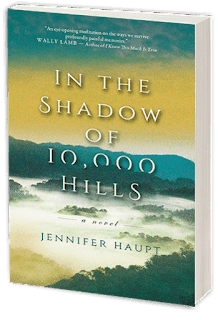 In the Shadow of 10,000 Hills (Central Avenue Publishing, forthcoming April 2018) is just such a book. Ten years after the 1994 genocide against the Tutsi in Rwanda, journalist Jennifer Haupt traveled the country, interviewing survivors and aid workers, learning about the impact of this terror and the difficult process of reconciliation. From that trip was born a moving novel exploring themes of love and family, violence and peacemaking, and grief and forgiveness. The story centers around Lillian Carlson, a young African-American civil rights worker from Atlanta, inspired to move to Rwanda to found an orphanage following Dr. Martin Luther King, Jr.'s assassination; Henry Shepherd, the white photographer who leaves his family to make his home with her there; and Rachel Shepherd, Henry's daughter. Years later, married and hoping for a family of her own, Rachel experiences the devastating death of her unborn baby. In her grief, Rachel seeks out the father who left her, the last family she has. Rachel's research leads her to Lillian's orphanage, the children she cares for, and Tucker, a young doctor who devotes his time to them. Henry, however, has vanished. Rachel arrives to a community still reeling from the violence. Entire families slaughtered, neighbor turned upon neighbor, survivors traumatized. As her search for Henry unfolds, Rachel becomes close to the children, Tucker, and Lillian. Meanwhile, the official reconciliation process begins, and tensions begin to rise again. As the truth of the most horrific act of violence in the village comes out, so does the truth about Henry Shepherd. In the Shadow of 10,000 Hills transported me to this beautiful, injured country and made vivid a event that has otherwise been hard to fully comprehend. I loved the way the characters fought to save each other, protect each other, and help each other heal, however best they could. Above all, I loved that this book felt so, so personal. I can only imagine how powerful an experience it was to travel there, to hear the stories, and to bear witness. 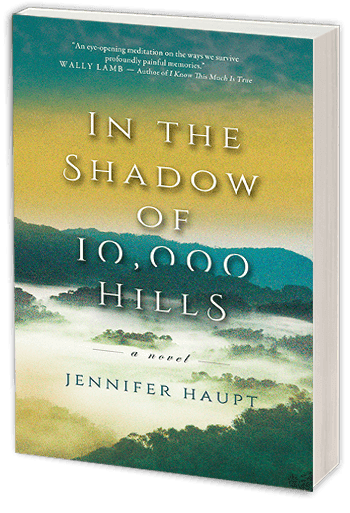 I received a complimentary Advance Reading Copy of In the Shadow of 10,000 Hills from the author. This book sounds quite emotional, though one of my first questions involves race: are these all white characters who travel to Rwanda? If so, it seems odd that the author would do so much research about the genocide in Rwanda to have a novel populated by white Americans.